12/20/2018 – All mashua varieties that will be available for 2018/19 are now in stock. Four important tuber crops were developed in the Andes: potato, oca, ulluco, and mashua (Tropaeolum tuberosum). Mashua produces tubers that range commonly from 2 to 10 inches in length and can yield very large quantities. 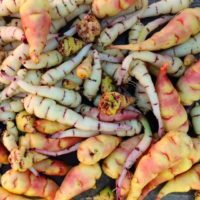 Although not as colorful as oca or ulluco, the tubers are still quite beautiful. All parts of the plant are edible, raw or cooked, but very few people like the flavor of raw mashua tubers. Fully cooked, they are somewhat similar to turnip. The leaves taste like spicy mustard greens and the plants are well worth growing as a leaf crop even if you don’t like the tubers. Mashua is somewhat tricky to grow, as it does not do well in temperatures that much exceed 75 degrees and needs a frost free growing season through October.